•Spray Weed Control - All season long weed seeds are always drifting into your yard and need to be fought against constantly. With our special broadleaf weed killers, you can be sure that the battle will be won. We an treat your yard throughout the seasons for the best results. •Spring - In the Spring we begin the year with a balanced feeding of fertilizers with pre-emergent crabgrass weed control. Quality Green's GREEN GUARD stops the crabgrass in the Spring, before it gets started. This has been proven to be the most effective way to deal with that troublesome weed. This application includes a fast released nitrogen for quick green-up and gets your lawn off to a strong start. This application also includes broadleaf weed control if weeds are active. The Battle Begins! •Early Summer - The Early Summer application provides a balanced feeding of slow release fertilizer to keep your grass growning strong to thicken their roots and naturally fight off the advancing weeds. And again we will apply broadleaf weed control to destroy those Dandelions! •Late Summer - The Late Summer application provides a complete seasonal fertilization adapted to your lawn's needs, and continuing broadleaf weed control keeps your yard looking its best and helps keep those nasty weeds under control. Knock Out Knot Weed! •Fall - The Fall application provides a high potassium turf food to get those roots ready for winter. This is necessary for a strong lawn next spring. •Late Fall - The Late Fall application is an optional fertilizer application that is specially blended to promote fall root development and nutrient storage for winter survival. •Lawn Aerating - In addition to properly mowing, fertilizing and watering your lawn, aerating should be considered to help promote improved soil density and a strong root structure for a more healthy lawn. When the roots of your lawn are thick and strong they help to prevent the growth of weeds. •Specialty Applications - Our additional, specialized applications help to Guard Against Disease and Insects. Most healthy lawns are not bothered by these problems. However, on occasion, they do occur. Quality Green has fungicide and insecticide treatments available to combat these problems. 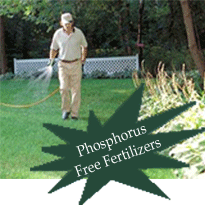 And, we offer specialized sprays for the health of trees and shrubs.